Oven-roasted potatoes drizzled with a spicy Bloody Mary reduction. Halloween is exactly 1 month and 3 days away. I’m slowly seeing creepy decorations make their way to neighboring front porches. I may have been a bit excited and started decorating for fall September 1st. You see, fall is my very favorite season…ever! The air is cool, and it smells crisp with a hint of bonfire smoke in the evening. Speaking of bonfires, fall is officially bonfire season. Maybe there’s nothing specific marked on the calendar, but I’ve decided to deem fall bonfire season. Let’s not forget about apples, pumpkins, and squash. I pretty much live off of those three things during the fall season. This week, the #SundaySupper team is adding a fourth produce item to the fall produce list: potatoes. Oh, and not just any potatoes. We’re talkin’ Idaho® potatoes. I don’t know about you, but whenever I think about the geographic location of potatoes, my thoughts head straight to Idaho. It’s the potato capital of the world! The #SundaySupper crew is on a mission to spookify Idaho® potatoes. I can’t think of anything spookier than blood, so I decided to make Bloody Mary potatoes for the occasion. When I was a kid we would scare ourselves crazy standing in front of the mirror in the dark chanting Bloody Mary over and over again in hopes that she would appear in the mirror. Obviously, she never appeared, but it was the “what if” that scared our pants off. I quartered a bag of Idaho® baby potatoes. I place the potatoes in a large bowl and drizzled them with a tablespoon of extra-virgin olive oil. To give the potatoes some flavor, I sprinkled them with garlic powder, onion powder, and salt. I roasted the potatoes at 400 degrees F. until they became golden and crispy on the outside. It’s hard to keep my fork out of a bowl of perfectly roasted potatoes–they’re absolutely addictive! The crunch of the golden, crispy potato skin breaks open to reveal a creamy center. After the potatoes come out of the oven, they get drizzled with the Bloody Mary reduction. If you love the classic Bloody Mary cocktail, then you’ll love this sauce–it tastes just like the cocktail, only thicker. The sauce is mildly sweet, tangy, and extra spicy. If you don’t like a lot of spice, reduce the amount of horseradish. 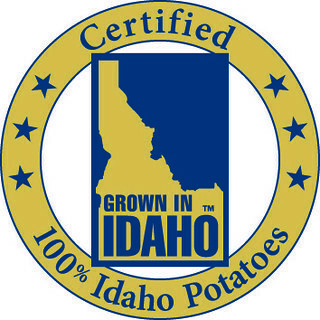 For more potato inspiration and recipes, follow Idaho® potatoes on Twitter, Facebook, Pinterest, and Instagram. Preheat oven to 400 degrees F. Line a baking sheet with parchment. Add quartered potatoes, olive oil, and spices to a large bowl. Stir to combine. Transfer potatoes to your prepared baking sheet and spread out evenly. Bake, flipping the potatoes every 10 minutes so they crisp up evenly on all sides, for 35-40 minutes, or until golden brown and tender. While the potatoes are roasting, heat olive oil in a saucepan over medium heat. Add garlic and diced onion; cook, stirring often, until translucent, about 3-5 minutes. In a large measuring cup, whisk together V8 juice, cornstarch, horseradish, ketchup, celery seed, smoked paprika, lemon juice, and hot sauce until combined. Add the V8 mixture to the saucepan with the garlic and onion. Cook, whisking occasionally, until the mixture thickens and reduces by almost half, about 15 minutes. Add salt and pepper to taste. Drizzle the Bloody Mary reduction over the roasted potatoes. Top with chopped parsley. Disclosure: This post is sponsored by the Idaho Potato Commission. All opinions are my own. Love the story of when you were a kid standing in front of the mirror and calling out to Bloody Mary and love these potatoes too. Yum! Fall is my favorite season too, and I love all of your Halloween decor. And your potatoes too…they look fantastic! Oh, boy, would my family love these potatoes!! And isn’t it funny what we did as children??? Cute story! These potatoes sound so good I’m not waiting until Halloween to make them! Ha Ha I love it!! What a great idea and so perfect for a party! Fall is my favorite season too! The Bloody Mary sauce sounds soooo good! Okay, that sounded a little creepy…. Fall is absolutely my favorite season! I love everything about it. Your photos are gorgeous and I love all the Halloween accessories. And your Bloody Mary sauce sounds fantastic! omg … before I even get to the potatoes, I just have to say that is the PERFECT dish to serve these in! Adorable! And those potatoes? OH MY … YES! They look and sound absolutely delicious! Pinning now! Yup, I definitely pulled out my fall decorations September 1st this year. I couldn’t help myself – it’s my favorite season! And these potatoes are so fun!! I love it! I used to do that Bloody Mary thing in the mirror too and I would be so freaked out every time! Your potatoes sound yummy and look awesome too. That tomb serving dish is super cool! I am a huge potato gal, basically, if it has potatoes, I’m on board, I really like the horseradish in this recipe! These are anything but boring! These sound delicious AND look amazing. I love the little coffin! Fall is my favorite too. And even though I don’t like scary things, I think I can handle these potatoes….ha ha ha! They look delicious! Not only do these sound absolutely delicious, they look super creepy – I love your presentation! I remember doing that as a kid too! Scared the bejeebers out of me! I am in love with these potatoes, that sauce sounds devilishly good! Jennie, these are perfect for an adult Halloween cocktail party … one with real Bloody Marys too! Kids who really like spice will like them too. Very creative. I’ll be trying them! I am loving your Halloween decorations! These potatoes look delicious, and the presentation couldn’t be cuter! That sauce sounds addicting! These are fabulous. I love your creativity to pull in those childhood memories/nightmares of saying, Bloody Mary, in front of a mirror and bring them into a delicious dish! You are too cute. I love this spooky set up. I can’t wait to make this bloody sauce. I cen see it finding its’ way on to a nice steak too! I used to do the bloody mary bit in front of the mirror too! We’d always freak ourselves out. These potatoes are just perfect. The roasting, the sauce, everything! Your potatoes are a much more delicious way to go when it comes to bloody mary-s! Love the food in the coffin. Although it sounds really weird! Mummies for dinner and blood for breakfast!